Add some final polish to your presents with pretty holiday wrapping papers (D, $4.29 to $9.99, www.containerstore.com), plus shiny tinsel tape (E, $6, www.worldwidefred.com/tinseltape) that will make your gift boxes sparkle. Keep holiday goodies and decorations organized, or delight uber-organized friends with a Label Maker with Case (C, $49, www.containerstore.com), also from the Container Store. Brookstone’s wireless WeatherCast 5-Day Forecaster with Alarm Clock (F, $100, www.brookstone.com), the new iPod Touch (G, $299, www.apple.com) and the pocket-sized digital photo album WalletPix (H, $29.99, major mass retailers) all make fantastic stocking stuffers for the gadget lover on your list. All three gizmos are fresh on the market, fun and easy-to-use. A bottle of Greg Norman Estates Australian Sparkling Chardonnay Pinot Noir (B, $16, www.gregnormanestateswine.com) makes a great host gift for those celebrating on a budget and it’s perfect for pouring at New Year’s brunch. Smith and Hawkin’s Paperwhites in Twig Basket (A, $42, www.smithandhawkin.com) also makes a lovely host gift with fragrant flowers that are easy to grow for novices and green thumbs alike. 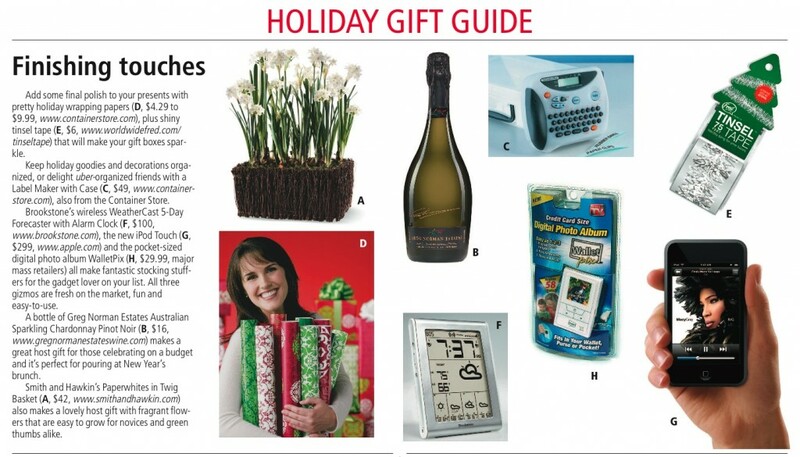 Article published in The San Fransisco Chronicle’s “Holiday Gift Guide” custom publication on December 5, 2007. Download PDF of original article “Finishing touches” to view full layout with PHOTOS!